Back again, this time with more sale bargains/shopping picks! This is such a comfy and light playsuit - I know I'll definitely be getting my wear out of it this summer! I also think it's boho style print would make it perfect for a festival or holiday outfit! The wedges from Shoe Zone are not only another bargain item but they're also super comfy and a great addition to the summer shoe collection as they're so versatile and will go with lots! Hurray! Thank you sweetie! I loved your recent holiday photos - such a great post! Thanks lovely really glad you liked! fell in love with the peter pan dress & the blazer, absolutely stunning. You are always the sweetest thank you Christina! I love the pink floral dress, that is one of my favorite colors right now! Thanks! I followed you on google and bloglovin, hope you'll do the same. Thanks for checking out my blog Gabriella. Let's keep in touch! cute outfits!! love the second one doll! Thank you babe! So glad you liked and commented! 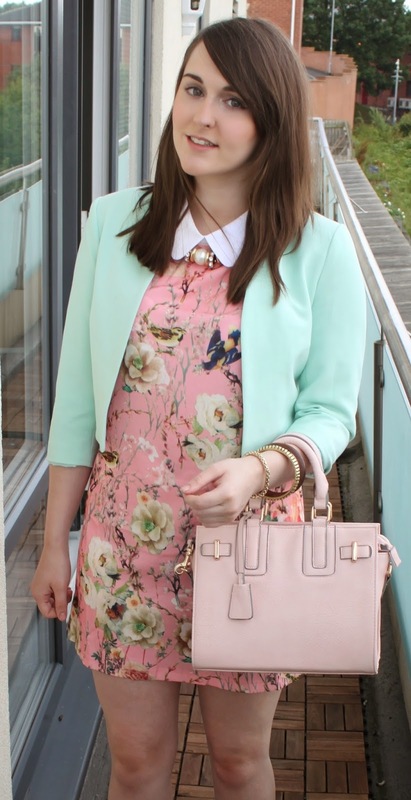 love the print of the red playsuit and the pastel colours of your second outfit! Thanks so much so glad you liked the dress & outfit! Yeah I totally agree that's the best part of fashion being able to match your clothes to how you're feeling wether thats girly, grungy or whatever! love how you styled these outfits. your romper is adorable, and that mint blazer in the second outfit is amazing! These outfits are both gorgeous! I love the playsuit in the first photo and the blazer in the second photo :D so stylish! The playsuit is so cute! Hi Gabriella! Thanks for stopping by my blog and leaving a comment! I love your peter pan collar dress so much and I love how you styled it! So romantic and ladylike! Hi Denisa, thanks for commenting really glad you liked the dress! Falling In Love With Ark Clothing (Again)! Newlook Haul - Going Crotchet Crazy!